It's worth knowing on exactly which date and at what time you can make these bookings, as the online allocation tends to disappear quickly. Concierge guests and guests who have booked the Romance At Sea package can book activities, spa treatments, child care and Palo reservations online 105 days prior to their cruise, Castaway Club members (previous Disney cruisers) can book 90 days prior, and everyone else can book 75 days prior to their cruises. Mark your calendars and plan to be online at midnight eastern time to secure your choice of times. 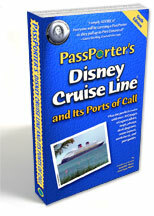 Before your booking window opens for all these activities, now is the time to learn more about what is offered and there's no better way to do that than by reading PassPorter's Disney Cruise Line guidebook. It will prove to be an invaluable resource as you plan your trip. You won't believe how much information this guide contains about your Disney cruise. When I first got a copy, my jaw dropped to the floor as I found out about the best times of the year to cruise, the different categories of stateroom, when and how you can book your shore excursions, the restaurants and activities on board, and the various ports of call. Once you've done your background reading, then you're ready to make your bookings either online or during your first couple of hours on board. Check your PassPorter also for information on guidelines regarding dress codes and packing lists to help you get organized! This article originally appeared in our March 1, 2007 newsletter and was last updated on February 19, 2008 -- subscribe to our popular newsletter today for free!